Wed, Mar 21, 2018, 11:51 am SL Time, ColomboPage News Desk, Sri Lanka. 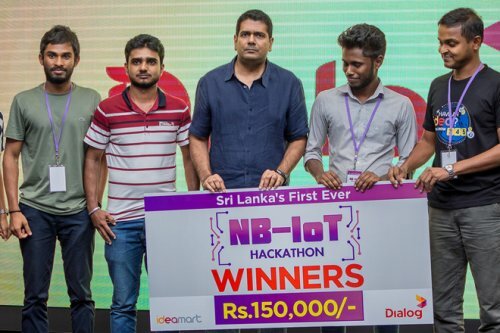 Mar 21, Colombo: Dialog Axiata PLC, Sri Lanka's premier connectivity provider, in collaboration with Ideamart, hosted Sri Lanka's first NB-IoT Hackathon (NB-IoT: Narrowband Internet of Things). The first to launch the technology in South Asia in October 2017, NB-IoT is a narrowband radio technology specially designed to enable seamless connectivity amongst devices using Low Power Wide Area (LPWA) technology. Held on the 17th of March, the hackathon consisted of 9 teams tasked with creating NB-IoT solutions using Dialog's IoT platform or making existing solutions NB-IoT compatible. To date, Dialog's developer relations and community development arm, Ideamart has conducted over 15 NB-IoT awareness sessions around the country for students, technologists and startups. The hackathon was carried out in two phases; phase one being a pre-hackathon event on 15th March to educate participating teams on Dialog's NB-IoT network, special device packages, IoT developer kits and the future of IoT in Sri Lanka, and phase two being the hackathon itself, held on the 17th of March at the Dialog Head Office Auditorium. First place winners, Team Death Squad from Innova IT Systems, received Rs.150,000, while 1st runners up, Bite Code from the University of Peradeniya won Rs.100,000 and 2nd runners up, Team Strangers from University of Rajarata and Team Myhub from MyHub.lk walked away with Rs.50,000. Consumer based solutions initiated at the hackathon included a water quality monitoring solution for the Anuradhapura district, infant healthcare solutions and comprehensive fitness bands that use the NB-IoT network and Dialog's existing IoT platform. Speaking at the event, Guest of Honour, Jaikishan Rajaratnam, Global Head of Technology, GSMA said, "We are seeing huge growth in the availability of commercial mobile IoT networks in licensed spectrums around the world, with 41 such deployments now operational. Events like these are a great way to accelerate the adoption of these new networks and encourage the development of innovative new products and services in the IoT space." Supun Weerasinghe, Group Chief Executive Officer, Dialog Axiata PLC added, "The deployment of the NB-IoT Network in South Asia was a not only a significant milestone for Dialog Axiata but a key enabler towards a Digital Sri Lanka. It is paramount that we place this technology and infrastructure in the hands of our local talent to continuously innovate and create new solutions that would empower and enrich Sri Lankan Lives and Enterprises." The introduction of NB-IoT to the market will increase the adoption of emerging IoT technology and other related devices. Operating in a licensed and regulated spectrum, NB-IoT is less susceptible to interference and enables secure and reliable communication. It was introduced as an enhancement to the 4G LTE network standard in June 2016, and has several key enhancements for connecting billions of devices to the internet using existing LTE infrastructure. Key features of the technology include longer battery life for devices, unified coverage, secure connectivity, high reliability and easy deployment into existing cellular network architecture.